Being an ISO 9001:2008 certified company, Gayatri Control and Automation Pvt. Ltd. (GCAPL) is a renowned name in the Automation Industry for its top quality Control Panels and custom made as per the requirements and specification of the customers. Due to its approach of providing consistent, accurate, and quality products, GCAPL has successfully developed a wide customer base not only in India but also across the world. GCAPL manufactures Control Panels to meet the needs of various industries ranging from plastic machinery to road construction machinery, rolling mills to material handling equipment, air compressors to printing and packaging machinery. Also on the anvil are plans to further expand the scope to other manufacturing industries. Other than the standard range, the company has the highest technological capabilities to offer suitable tailor made system as per specific requirements of the customer. 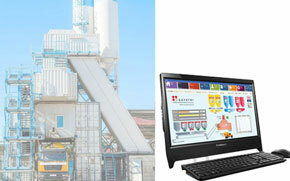 The system uses touch screen PLC technology to integrate all the batching functions into one integrated controller which provides real time batching control on a PLC and all in one PC. Windows based user-friendly system will inspire you with how quickly a new operator can learn the system. Plants can be operated and monitored from two places, which allows you uninterrupted smooth production process. Alarms messages with history of fault warning. Total 999 Recipes can be configured according to batch requirement for fast production. Any part of the plant can be run manually and controls are customized to your exact plant needs. Fully interlocked system complies with all safety standards for global market to prevent accidents and lost time. This Control System provides the precision necessary for today’s increasingly sophisticated batching control with latest technology.